Social Media Monitoring | Shoppers, Inc.
For most shoppers, the customer experience begins and ends with online reviews. Whether customers are looking for a new restaurant or a new product, reviews and profile information affect their purchasing decision. After they finish their experience, online reviews are the best, most natural source to collect customer feedback in volume. Responding to reviews is a great way for business owners to add a helpful comment to a user’s review. Responding to reviewers’ concerns shows that you value their feedback and that you are always striving to improve. 33% of companies aren’t monitoring what is being said about them online, which can greatly affect sales. Amazon, Google, App Store, Best Buy, Booking, Expedia, Facebook, Foursquare, Home Depot, Hotels, Yelp, TripAdvisor, OpenTable, etc. Claimed Profiles: We can help consumers find you by creating and claiming essential online profiles on sites like Google, Yelp, and many more. Consistent Business Name: We make sure every online profile has the same business name and information to maintain brand consistency. Correct Address: Don’t send customers to the wrong address. We monitor your locations’ addresses to make sure they are consistent and correct across every profile. Consistent Hours: Nothing frustrates a customer more than incorrect hours. We make sure all hours are up-to-date and correct for every location’s profiles. Other Correct Data: Whether it’s your phone number or online menu, we make sure all other important data is present and accurate so customers have the information they need at the right time. How does it work / what are the options? Social Media Rating: Shows the breakdown for numeric ratings received in this period. 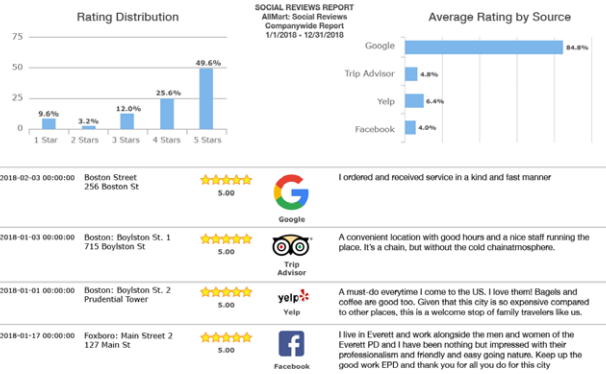 Total Social Media Score: This location YTD: Show the individual reviews and ratings for this location in this time period. Company Social Media Rank YTD: Shows scores and all reviews for an entire company. It’s ideal for companies with a single person designated to respond to all online reviews. Contact us today to learn what your cost will be and how we can help you track your Social Media faster and more efficiently.